“This year has not been without its bumps in the road, but we have overcome. As a result, we have succeeded in being an executive that serves the students with a passion to truly give the best we can,” said Concordia Student Union President Heather Lucas during her president’s report at the CSU’s Annual General Meeting May 9. The Hive Café luncheon—which went from serving 90 to 160 students, the creation of an international service bursary, the fights against tuition increases and demanding transparency from university governance were among the accomplishments that Lucas touted to the small crowd that gathered in the lounge on the seventh floor. Lucas also mentioned the successful campaign to ban water bottles from campus vending machines. Lucas also mentioned the addition of new clubs, most notably the Concordia Starcraft Society, as an accomplishment which garnered a round of applause from those in attendance. During the report by outgoing VP Finance Ramy Khoriarty, it was revealed that the CSU ran a $36,000 surplus, lower than the $55,000 expected. After disclosing some of the budget lines in the CSU’s books, an idea was put forward by incoming VP Finance Jordan Lindsay to find a new auditor for next year. The current auditor is accounting and consulting firm Deloitte, which Lindsay described as expensive. “There are other [auditors] that can do a great job, and we’d like to see what else is available before we go with Deloitte,” he said. Khoriarty also explained that no final report for CUSAcorp, the for-profit arm of the CSU, could be made available in time for the AGM, but should be expected soon. He also revealed that Reggie’s contract with Molson was expiring, and that the CSU is currently in negotiations with two brands vying to be the beverage of choice at the student bar. Before getting down to this year’s CSU business, the crowd on the seventh floor heard a report on the controversial CSU election from Chief Electoral Officer Oliver Cohen. 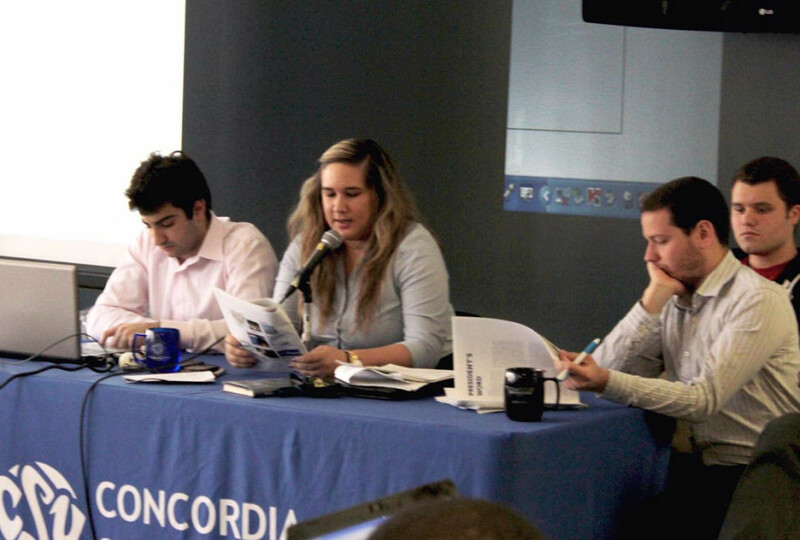 The Judicial Board overturned Cohen’s decision to disqualify the victorious Your Concordia slate two weeks ago, while upholding the disqualification of the opposing Action slate. Cohen referred students to consult his full report on the election, which he said will be available on the CSU website next week. He then attempted to leave, before being persuaded to return to answer students’ questions.